I was quite relieved last month when it came time for the children to return to school. Finally I could get some respite from looking after my two children - Alexander, seven, with Down’s syndrome, and Robert, four and a half. Although my boys are pretty good on the whole and play together quite well, they need almost constant supervision. Without it, Alexander can have a tendency to hit the TV, chew toys or wee on the floor, so vigilance is required. One day just before the return to school, I was in the supermarket and I bumped into an acquaintance with two children, who said how sorry she was that the holidays were over and her children were going back to school. I did have to admit that I didn't share her view. Later that day, I bumped into the mother of an autistic child, and we raised our arms to the heavens with relief, and then compared notes on what time we started our first bottle of wine just to get through the day. Alexander is now in Year 2 and, although the school he attends is very supportive, of course I worry about his progress and the growing gap between him and his peer group. Alexander has a Statement of Special Educational Needs, and it is specified that he has 20 hours a week of 1:1 support from a teaching assistant. The school provides extra help to make sure he has support for the full day. He had been really looking forward to going back to school and seeing his friends, but it was inevitable that there will be some teething problems as the school has a shared Year 1 and Year 2 classroom, so there is a whole class of new children for Alexander to get to know, and they need to get to know him too. It may sound awful to say but, for me, one of the worst parts of the day is picking him up, because of the prospect of hearing the teacher say: “I’m afraid Alexander hasn’t had a very good day…” I wait with dread to hear what has happened. Did he hit someone? Has he had more than one wee “accident”? Has he torn the pages from a book? I am expected, after the event, to try and talk to him about it. In truth the teachers, TAs and I have a good relationship and work together very closely to figure out how to help Alexander get the best from school and to manage any behavioural issues. I believe that the policy of “inclusion” – educating children with special needs in mainstream schools – is a good one, and for the majority of children with Down’s syndrome it is fairly successful. But it takes a lot of work from a range of people to make it happen, not least the parents. Each term the school prepares an Individual Education Plan (IEP), which is then agreed by me and the teachers. Later Alexander will be able to comment on it too. I will keep my hands to myself when I am sitting with the class on the carpet. I will know that when a collection of counters or objects are moved there is still the same amount. To hold a pencil effectively so that I can write my name. We talk to him about these targets a little, but generally it is up to the teachers and TAs to follow through with actions to support him. We’ll play it by ear as to when he is actually asked what he would specifically like to work on. The big event this term will be the Annual Review meeting, in which I meet with the teachers and various other professionals (speech and language therapist, educational psychologist, someone from the Down’s syndrome and Special Educational Needs Service) to discuss Alexander’s progress and set targets for the year. I have to steel myself not to become emotional at the meeting. 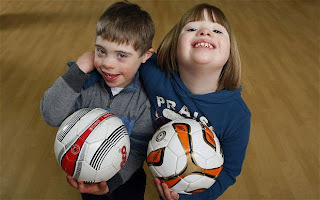 But in my opinion, one of the most important reasons for encouraging inclusion is that a whole cohort of children will grow up knowing someone with a disability – there are 45 more children who will go out into the world having experienced learning with someone (usually) less able than themselves, and I hope it will teach them a little bit about tolerance. It does have its downsides, though. Alexander is seven and, although he has been invited to birthday parties, he has not yet been invited home to play with anyone after school and, frankly, I’m not sure how we would cope if he were, though Alexander has one particular friend who has been to play at our house a couple of times. So far, the only times we go to other children’s houses to play are to those families I know from before children, or people we met at baby groups, and it is still seen as normal for me to go along for a chat, too. But what is going to happen when Alexander turns 10, or 12, or older? We all know how important it is to have friends with shared experiences, and the same applies to a child with Down’s syndrome. That is one of the main reasons why many parents opt to send their child to a special school when it comes to secondary education, so that they have more of an opportunity to make friends. For the time being, I make sure that we spend quite a bit of time with other “DS” mums and their children, to give Alexander an opportunity to make friends, and it has the added bonus of giving me and my friends a chance to let off steam to others who really understand! Well, it is a pretty good idea. Early exposure will definitely be good for all the kids. I just can't help but think that companies like prudential life should come up with a special policy of sorts for needy children like these. It is admission time and you should not wait for the application.When you are get into here from this source you can get the personal statements for the nursing course. You should get help from here on how you can apply for the admission.When you are get into here click this link now you can know the important parts of personal statements. You cannot just go there without sending them a pure application form.When you are get into here http://www.personalstatementpharmacy.com/pharmacy-school-letter-of-recommendation/ You can get the recommendation letter writing service. This down syndrom let a lot of students ruin their career. This is the right site http://www.phdexpert.net/ which will provide you your thesis paper. I think every kind of relationship in the school time should be friendly. When you click this link http://www.collegeadmissioncounseling.net/stanford-college-application-essay/ you will get consultant service for standford college. There has some issues which let this things happened and make it down. In this site http://www.lit-review.net/literature-review-help/ you get help for literature review on your topic.